Dog hair loss before and after photos - the amazing transformation of Zee Zee, a dog with a condition of canine atoptic dermatitis. Dermacton cream, spray and shampoo work to effectively condition your dog's skin to promote hair growth. That poor animal. Unbelievable condition that turned around. Why not make some advertsing on this Dermacton and get it placed in pet stores? My landlord told me about it that is how i found it online. If this Dermacton product was pitched to the team on Shark Tank it would go bonkers viral. If you ever need a distribution center solution go ask Alice! We appreciate all of your comments in regard to the PetNat Dermacton line of products. We are the sole distributor in the USA and we import in bulk from the manufacturer Aromesse in the UK. As the distributor, we don't have the rights to pitch this to the folks on Shark Tank (although we agree that would launch this into a huge orbit given our photographs and testimonials). We hear what you are saying and always pass along comments to the manufacturer. We do a limited amount of advertising now and plan to do more in the future as the USA distribution is continues to grow. Currently, the vast majority of people find out about us via word of mouth and online searches. 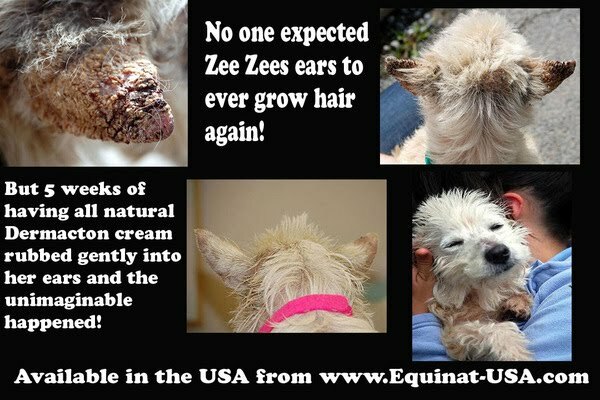 Thank you for your support in getting the word out about Dermacton for dogs.